OpenORE is a website for sharing research data with researchers. Users will be able to exchange links to and information on code, models, projects, data, media, etc. relating to offshore renewable energy (ORE). It will not host data! Instead it will be a searchable and bowseable directory tailored to ORE, sign-posting users to data hosted elsewhere. Code – We recommending hosting open-source code projects on GitHub or Bitbucket, which are built for version control and collaboration. For smaller MATLAB code snippets, the MATLAB File Exchange is good. Data – For experimental results, computation model input and output files, and other large data sets, you may want to host it within you own organization (e.g. NNMREC Open Data). However, another great option is the Open Science platform – Figshare. Links – OpenORE will be a hub that directs users to the numerous open source software projects (e.g. DTOcean) and open access databases (e.g. 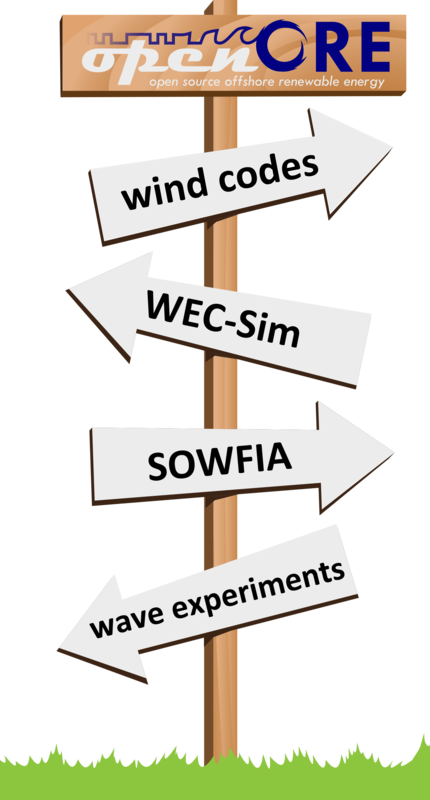 SOWFIA) that already exist or are being developed. Controlled data – On OpenORE, data-sharers may lists data sets or code simply as a description with contact information, allowing users to request the data and the data-holder to control its release. For example, IT Power Ltd’s ROMS-Tidal-Array software. OpenORE will help researchers to use data and code! One of the biggest challenges with using some else’s project is help and documentation (see the User Experience page). OpenORE will have forums for asking questions and sharing information, and rating system so that good content becomes more visible. OpenORE will be tailored to ORE code and data. It will use built-in categories and user-defined key words, and will have search and browsing capabilities. The browsing will be like a shopping website, allowing users to easily find what they need. Minor correction: GitHub and Bitbucket are for hosting version control repositories, mainly Git, not Subversion.